How Can an Advanced Student Move Ahead in Public School? 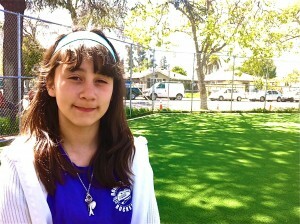 As her mother saw it, Sintia Marquez was too smart for her school. She'd outpaced her school's ability to keep up with her by fourth grade. So her mother moved Sintia to a new school, a charter called Rocketship Mateo Sheedy Elementary, which focuses on the concept of individualized learning. What's different about Rocketship is the school's focus on allowing students to progress at their own pace. Teachers introduce new concepts in class, and students practice the material they've learned in a computer lab, a system called hybrid learning. Rocketship also has a longer school day -- from 8 a.m. to 4 p.m. -- and an intense program to motivate kids, even as young as kindergarten, to think seriously about going to college. If state assessment scores determine a school's success -- and in this high-stakes testing environment they certainly do -- Rocketship's flagship school qualifies as a winner. For the past two years, the school has scored 925 on the Academic Performance Index (API) -- the same score earned by Palo Alto School District, a neighboring community with a much more affluent demographic. It bears noting that, of the 463 students at Rocketship, 91 percent qualify for free or reduced lunch program, and 71 percent are English as Second Language learners. Rocketship Mateo Sheedy is one of three Rocketship charter schools in the area, but the organization has plans to expand across the state and eventually across the country. They offer open enrollment (not lottery, like many charters) and receive funding from local, state, and federal taxes, as well as from venture capital. In the first of a new series on MindShift called My Education, we focus on how this new technique in education -- hybrid learning -- works with a high-achieving student like Sintia. In the course of the following days and weeks, we'll explore how the hybrid model works, the powerful school culture, the highly engineered block schedule, the specifics of the adaptive software used in the learning labs, the charter organization's plans for growth, their tactics for teacher retention (many of them are young Teach For America recruits and are committed to a two-year contract), and how teachers use data from the learning labs to help them guide their teaching in class. With this series, through the perspective of individual kids, we hope to discover how those from underprivileged backgrounds can strive beyond the confines of their circumstances, and to examine what tactics work (or don't work) in boosting them to a place where they might have a chance to learn the best they can. PART I: How Can An Advanced Student Move Ahead in Public School?